INDIANAPOLIS.- The Indianapolis Museum of Art has commissioned two new dramatic installations by artists FriendsWithYou and Orly Genger for its second year of site-specific commissions in its Efroymson Family Entrance Pavilion. Dream Maker, the installation by artist collective FriendsWithYou, is a wonderland of multiple balloon figures floating above visitors as they enter the Museum. Come, by Orly Genger, will be an immersive sculpture of knotted ropes that will hang from the ceiling, draping to form a small cave-like area that visitors can enter. The installations in the Efroymson Pavilion add an exciting new dimension to the experience of contemporary art into an encyclopedic museum. The artworks engage visitors within their first moments inside the museum, fostering a more spontaneous and fluid visitor experience. Under the leadership of the IMAs Senior Contemporary Art Curator Lisa Freiman, the Efroymson Pavilion installation series was launched in February 2007 thanks to a $2.5 million grant from the Indianapolis-based Efroymson Fund. The works are installed on a rotating basis with a new commission from a different artist approximately every six months. New York-based artist Tony Feher inaugurated the program in March 2007 with A Single Act of Carelessness Will Result in the Eternal Loss of Beauty, which was followed by Terrain, an audio sculpture by Julianne Swartz. FriendsWithYous Dream Maker, currently on view, is a mobile that spans 40 feet across the Efroymson Pavilion. 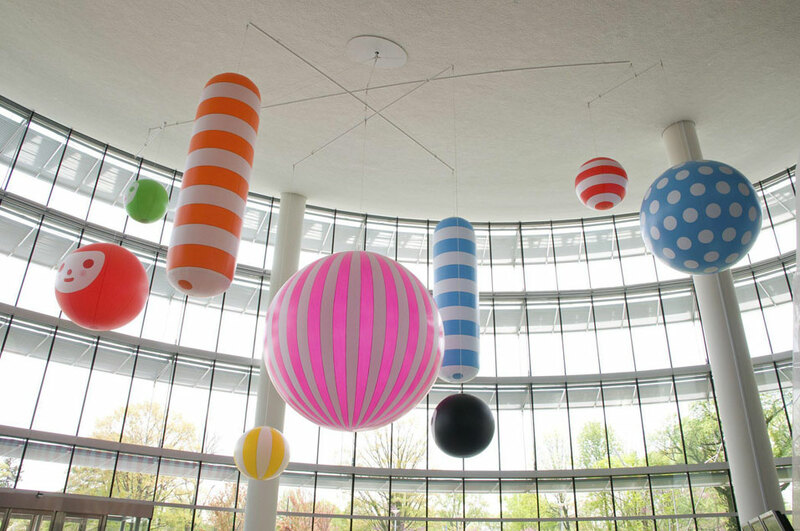 A number of unique, brightly-colored plastic balloons are suspended from a motorized, rotating frame attached to the ceiling. Founded by artists Sam Borkson and Arturo Sandoval in 2002, Miami-based art and design team FriendsWithYou promotes its message of magic, happiness, and friendship in popular culture by creating an expansive range of multimedia art and design including collectable toys, clothing, video, and theme parks. The Dream Maker mobile was commissioned in association with the IMA exhibition On Procession, curated by Associate Curator of Contemporary Art Rebecca Uchill, which included an art parade in downtown Indianapolis in April 2008. FriendsWithYou participated in the parade with a large inflatable toy called Mr. TTT, which was carried down the street by volunteers along with its own soundtrack. Dream Makers suspended, inflated orbs and characters recall the On Procession parade event as well as FriendsWithYous previous blimp parade Skywalkers, presented at Art Basel Miami Beach in 2006. Known for transforming common nylon ropes into inspiring objects that grow out of the feminist art movement and Post-minimalism; New York-based artist Orly Genger will hand crochet her largest, most ambitious work to date. She will pile more than 600,000 feet of brown painted rope into an enormous organic mound, entitled Come, that will measure approximately 35 x 20 feet. According to Genger, the nearly six-ton sculpture will be confrontational and persistent, a simple, but powerful flood of biomorphic form that will cascade from the ceiling. It will converge to form a cavernous opening at ground level, where one visitor at a time will be able to explore the sculptures isolated interior. Genger intends for the sculpture to dwarf not only the people who walk beside it but the entire space. Born in 1979 in New York City, Genger received her BA from Brown University in 2001, and graduated from the School of the Art Institute of Chicago in 2002. She has exhibited at the Aldrich Contemporary Art Museum, CT; the Queens Museum, NY; Socrates Sculpture Park, NY; and the Haifa Museum of Art, Israel.